Wenqin Performing Art Troupe from Zhejiang University. Zhejiang University's Wenqin Performing Arts Troupe will perform a number of artistic pieces, including folk dances, martial arts, Chinese classical music, Peking opera, and more. 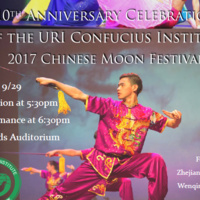 Zhejiang University (ZJU) Wenqin Performing Arts Troupe (浙江大学文琴艺术总团) was founded in 2001 with the financial support of ZJU alumna Ms. Yao Wenqin, who lives in America. The Wenqin Performing Arts Troupe is a team that can be the representative of students’ artistic standards and spirit of Zhejiang University. The Arts Troupe consists of six sub-groups, including the choir, drama club, dance group, orchestras, folk music and keyboard orchestra. There are over 300 members in the Art Troupe, who are students from the schools of science, technology, agriculture, medical, humanity, law, business and various others. The Wenqin Performing Arts Troupe has won over 50 awards and has performed in the United States, Russia, Australia, Japan, Spain, Germany, Hong Kong, Macao, Taiwan and other places, thereby enhancing Zhejiang University's cultural and artistic exchanges with overseas universities. Open to the public. 非常好！this celebration was so beautiful, and a great way to blend Chinese culture into our University!! I had a great time, the food was great and the performers were incredible! I can't wait to attend next year! Amazing performances I've never seen before! Very well organized and started right on time.